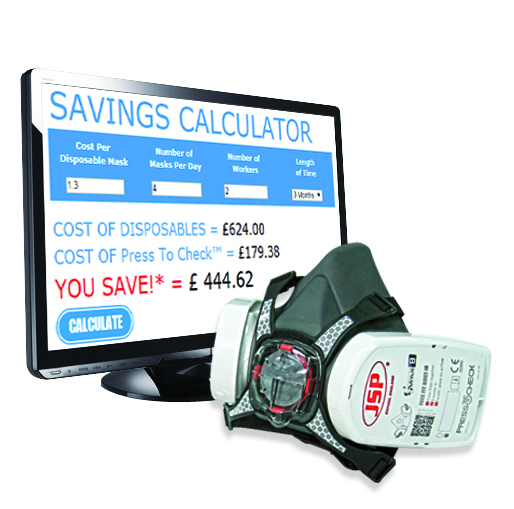 JSP has introduced a new calculator on its PressToCheck website in a bid to quickly illustrate the extent of the savings that can be made by using a reusable Force 8 half-mask with PressToCheck P3 filters, compared to disposable masks. The calculator can be found at www.presstocheck.com. According to JSP, hundreds - if not thousands - of pounds can be saved over a matter of months by using the system, which estimates replacing the filters every five days rather than after just one use. A Force 8 half-mask with PressToCheck is said to be more effective than a disposable paper mask, since the system enables the wearer to determine whether a proper face fit has been achieved. To use JSP’s PressToCheck: Fit – don the mask; Press – squeeze the filters together to create a seal; Check – inhale and feel the mask depress when an effective face fit is achieved, adjusting the mask if necessary.